Here's a great article from the Big Cat News Blog about the return of the Jaguar to Southern Arizona. 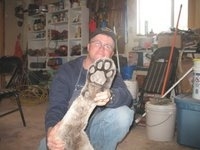 Visit them here: Big Cat Rescue. STATING that JAGS are back! This article is from October 2004; the Jags have had almost eight years since to expand their range. Considering this big cat has a range of some 500 miles, they could even be back in the Grand Caynon now (that is if they ever left). HAVE YOU SEEN A BIG CAT IN ARIZONA? 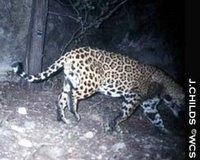 Here's an article from the Smithsonian Magazine: Smithsonian.com about the return of the Jaguar to Arizona. Doesn't he look cute? Did I mention they only eat meat! How about that they can swim? They prefer to hunt at night. They are beautiful creatures! The liger is a hybrid cross between a male lion (Panthera leo) and atigress (Panthera tigris). Thus, it has parents with the same genus but of different species. It is distinct from the similar hybrid tiglon. It is the largest of all known cats and extant feline. Per, Dr Bhagavan Antle (World renowned expert on Ligers and owner of Hercules and Sinbad the worlds largest Ligers ) ; Ligers are extremely social animals. They are happy and content living with both lions and tigers. They also display genuine affection for their human handler's and trainers. great resistance to illness and disease. I have spoke with Dr Antle at length about many topics. Although at first he believed a hybrid between a Puma (Puma Concolor) and a Jaguar (Panthera Onca) (Which I have coined as the Pumuar or Jaguma) to be not likely. When I laid out my scenario of a Male Puma and Female Jaguar, That possibly come in contact, at a young age. Part due to the young cats need for feline companionship and the lack of other jaguars in the area to social with. He agreed it would be very possible. When I asked if he thought that such a hybrid might be larger then both parents. He said it was quite possible and directed me to his article on Hybred Vigor. Large mountain lions seem to be widely seen in the NW part of this state. 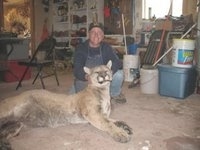 Larry Jenkins had Game and Fish tree a reported 300lb cat on his property just a few years back. After the cat chased his companion the day before. They (G&F) did not put the cat down, they just wanted to view it and tag it. Larry's cabin is well with in the range of the large mountain lion scene and killed in the Vail area north of Williams, pictured above on this page/column. The cat treed on Larry's property would be 33% larger then this already enormous Puma Concolor above. How would a cat get 100% larger then normally thought possible~~~Hybrid Vigor? I say that is quite possible! Are we then seeing the birth of a new species or the rebirth or a former species, the American Lion, or American Cave Lion (Panthera Leo Atrox), it may be? Jaguars are massive cats, much larger than even the biggest Florida panther. The size of these cats varies regionally. The largest jaguar ever recorded was a male that weighed 149 kilograms, more than 300 pounds. To put this weight into perspective, this animal was about as big as a defensive lineman for the National Football League's Jacksonville Jaguars. Most male jaguar weigh between 50-100 kilograms (110-220 lbs). Females will be about one-fifth smaller, and range in weight from 35-80 kg (75-175 lbs). In comparison, male Florida panthers weigh 45-70 kg (100-155 lbs) and female panthers weigh 30-45 kg (65-100 lbs). From tip of the tail to the point of its nose, a jaguar typically measures between 1.6-2.4 m (5.3-7.9 ft), with a shoulder height of 68-75 cm (27-30 in). Florida panthers are similar in length and height, and typically vary in length from 1.8-2.2 m (5.9-7.2 ft) and range in height at the shoulder from 60-70 cm (24-28 in). Consequently, the big difference between jaguar and the Florida panther is in body mass. The jaguar is more stoutly built than a panther, with a broader head, larger paws, and a shorter tail. A deep chest and barrel-shaped body are kept in motion by short, powerful limbs designed to take down large powerful prey in heavy cover, such as white-lipped peccaries and white-tailed deer. The fur of most jaguars appears buffy yellow or as a golden orange hue that shades into yellow. The jaguar coat, or pelage, on the upper part of the body is covered in spots. These spots are small and solid on the head and shoulders, but take the form of broken rings, called rosettes, on the back and flanks. Each rosette encircles an area with zero to three dots. The overall pattern of these rosettes is unique to each individual jaguar, just like fingerprints are to people. Underparts are white, and marked with black splotches or bars. This pelage is cryptic and camouflages the cat when it lies motionless under broken sunlight. Occasionally, jaguar are black, or nearly solid black, in color, an inherited genetic condition known as melanism. These "black panthers" still have their spots and if a person looks closely, the darker rosettes can be seen in contrast from the rest of the fur. Melanism has not been officially documented in the Florida panther. Figure 1. The jaguar (Panthera onca), also called panther, tigre or onza , is the largest and most powerful cat in the western hemisphere. Meet Macho B. Like the Florida panther ( Puma concolor ), that is threatened by human activities. The Jaguar is considered "Endangered". Jaguars have not been found in Florida since Prehistoric times. When Spaniards first discovered Florida, the northern limit of the jaguars range extended into Texas, New Mexico and Arizona. Further south, the jaguar was found throughout Mexico, Central and South America, all the way to northern Argentina. By the 1980s, the jaguars range was reduced by two-thirds in North and Central America and, within 75% of its present range, the jaguar has been reduced or greatly reduced in numbers. Although the jaguar has been virtually eliminated from the United States, photographs of a jaguars in Arizona were documented during 2002 and continued until recently, With the death of Macho B.
Jaguar require forest cover and can be found in almost any tropical forest type including evergreen forest, deciduous forest, and thornscrub. Jaguar are rarely found in grasslands devoid of trees. Additionally, this cat seems to prefer areas near water, such as the thick forest types found along rivers and floodplains. Like all cats, jaguars are strictly carnivorous, which means they only eat meat. They are not finicky eaters, with more than 89 species of animals recorded as prey for jaguar. These large cats prefer to eat other mammals, but have also been reported to eat birds, fish, snakes, and even caimans (a type of crocodile) and sea turtles. When possible, jaguars prefer to hunt large prey, such as white-tailed deer, collared peccaries, or large tropical rodents. Where these prey are available, a jaguar may only need to eat once or twice per week. On occasion, jaguar will attack cattle or other livestock, thereby causing conflicts with livestock owners. Jaguars are most active at night, early morning, and late evening. Like most wild cats, jaguars live alone and only come together for brief periods to mate. Males roam over large territories that can encompass 50-139 km2 (19-53 mi2) in many regions. Females have smaller territories, usually between 26-97 km2 (10-37 mi2). Several females may reside within the territory of one male, with which they breed. The resident male fiercely defends his territory from other male jaguar to ensure that the females in his territory mate only with him. As with other large wildcats, young males must roam large areas avoiding resident males. These young males, often referred to as "satellite" or "transient" males, must keep up this wandering existence until a resident male dies and leaves a territory vacant or they defeat the resident male in battle and gain control of his territory - and his females. Interestingly, Florida panthers actually use much larger home ranges than jaguar. Differences in home range size are related to habitat quality. Whereas the tropical forests in which jaguar live provide excellent habitat and abundant prey, the scattered remaining forests available to panthers in south Florida offer relatively poor habitat in comparison. Consequently, the home range of Florida panthers is considerably larger with male home ranges averaging about 520 km2 (200 mi2) and home ranges of female panthers averaging about 195 km2 (75 mi2). For both jaguar and panthers, therefore, the size of the home range is influenced by the availability of high quality habitat and prey, and this is particularly important for females raising kittens. The breeding season varies between locales and can occur during any time of the year. Pregnancy lasts about 100 days. The female will give birth to a litter of 1-4 cubs, usually two. Until the cubs are old enough to travel with her, the mother will keep them hidden in a secluded den site such as a cave or abandoned mine. The cubs remain with the mother until they are 1.5-2 years old. Males have no part in raising cubs. The Convention for the International Trade in Endangered Species (CITES) listed the jaguar in Appendix I, which means that it is illegal to trade in jaguar skins or parts, and that the transport of such items across country borders is prohibited. Likewise, the Florida panther also is listed by CITES in Appendix I. The Florida panther also is listed as a State and Federally Endangered Species, which means it is unlawful to kill or harass panthers, to possess skins, skulls, or any part of a panther, or to destroy habitat critical to the panther. Despite its protected status, the future of the jaguar is threatened by human activities even though the jaguar is threatened by human activities despite that the jaguar is legally protected in every country where they occur. Unfortunately, law enforcement varies among countries and is generally non-existent or very lax in most developing countries where jaguar are found. Jaguars are frequently killed to obtain their fur, for sport, or to protect livestock. The loss of forest habitat due to road construction, expanding agricultural, and other activities destroys, fragments, and degrades jaguar habitat in many regions throughout its range. With expanding human populations also comes increased hunting pressure on the preferred prey of jaguar in areas where year-round subsistence hunting is a way of life. All of these factors pose threats to the continued existence of this cat. Scientists and conservationists familiar with jaguar ecology are concerned that, without sufficient protection and management, the jaguar may disappear from most of its range by the end of this century. Similar conservation concerns exist for the Florida panther, albeit on a more urgent scale. Expanding urban and agricultural development, compounded by a rapidly increasing human population has continued to destroy, fragment, and degrade habitat in southwest Florida needed by the panther for survival. The exact number of Florida panthers remaining is unknown, but suspected to be less than 100 animals. Indeed, the plight of the jaguar and the Florida panther represent only two examples in the worldwide decline in populations of large cats everywhere. The question for the future, therefore, is whether humans will allow large, wild cats to share the planet, or will they be eliminated everywhere, forever.